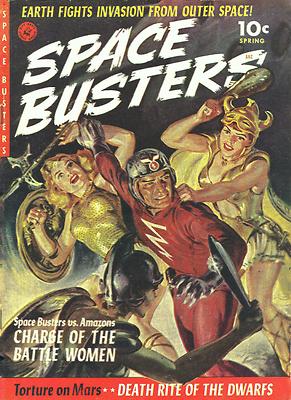 Hero Histories: Reading Room Annex: SPACE BUSTERS in "Empress of Belzar"
Reading Room Annex: SPACE BUSTERS in "Empress of Belzar"
SpaceBusters was a war comic set in the future. Think of it as a less-sophisticated version of Starship Troopers, sorta "Sgt Fury or Sgt Rock in Space"! Interestingly, it featured a woman (albeit noncombatant) as part of the front-line team. As to the plot...Belzar has invaded our Solar System, managing to conquer Mars, with Earth next in line. All three stories in #1 take place on Mars. We'lll be posting the other two later this week. and here are some War in Space-themed goodies from Amazon!